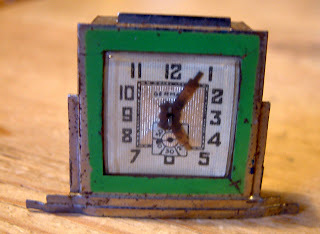 1930s Hobbies Dolls House Video - Happy Christmas From KT Miniatures! With 2011 almost at an end and Christmas nearly upon us, I am in the process of tying up loose ends before I shut down KT Miniatures for 12 whole lovely days! Just to remind you that I close this Tuesday 20th December and will officially open on January 2nd. However, I will try and dip into my emails occasionally during that time to keep an eye on things. Any outstanding orders after Tuesday will be despatched on January 3rd when the post office here in the UK re-opens. Thank you for your custom and your friendship in 2011 and hope you have enjoyed reading this little KT Miniatures Journal. I look forward to being back for my 16th year of trading on January 2nd. 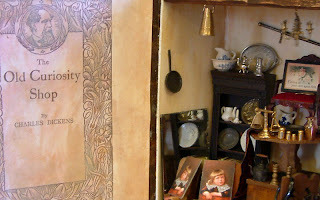 I can now give a sneak preview of this "how to make" project that has literally just been completed for the Dolls House & Miniatures Scene Magazine. It is due to be in the issue that comes out about February/March time I understand and is something very different from my usual projects. 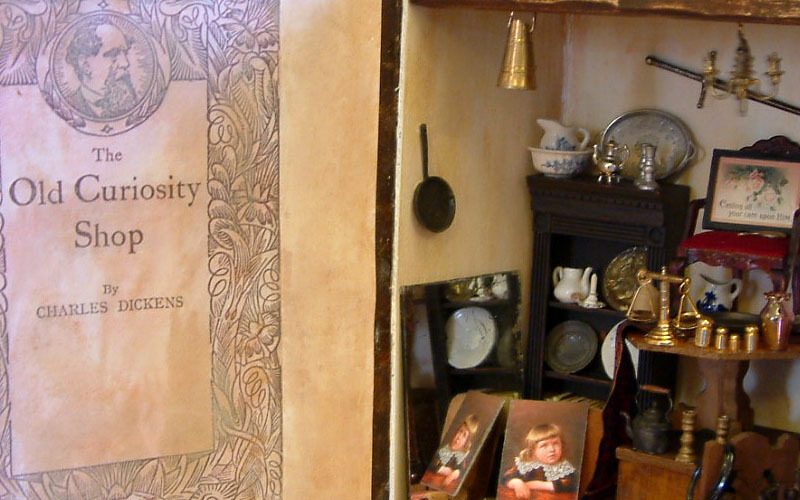 It is a scene from The Old Curiosity Shop - a novel by Charles Dickens and is set inside a model of an old book. The project will show how to create the book from simply cardboard, card and paint.....and also how to create the antiquated scene inside. 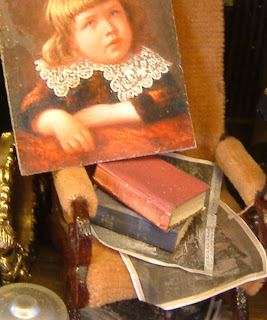 A variety of items were used in the shop scene including some of my handmade books and a replica of a Victorian family painting that was created to look like an old portrait on canvas. For those of you who are collectors of antique and vintage dolls house items.....no, your eyes are not deceiving you. Yes, that is an antique Victorian chair with red velvet upholstery you can see...and a vintage unmarked Elgin chair! Both were broken and totally unsalable so almost worthless in their present form - so no I have not completely lost my marbles as had they not been broken both would have been rather valuable! However they have been put to good use and are arranged in such a way that you cannot see the missing bits or damage. 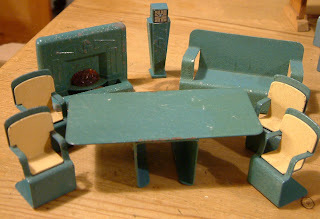 Similarly, I have used other old broken mini treasures such as a Victorian table that is minus a foot and a vintage chest of drawers with decidedly wonky drawers (not a pretty sight). Again, they have been arranged in such a way that one cannot see any damage......cunning eh? This was great fun to do. 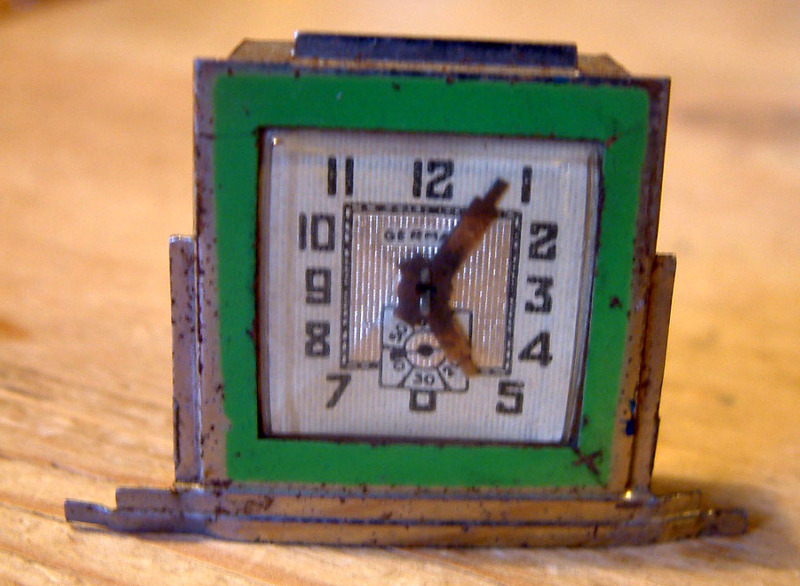 This little clock I just love but simply do not have anywhere to put it so.....go it must. 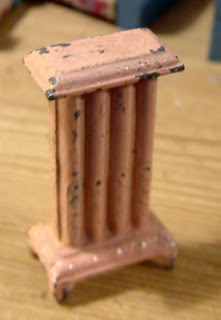 It is actually quite big measuring 2" wide at the base and 11/2" tall, so would suit an old dolls house where scale does not matter. But isn't it lovely? This is a pre war German radiator.....solid metal and extremely heavy; these radiators just do not come along very often, so is a bit pricey but if you are looking for something very different to either treat yourself or for someone who is an avid antique dolls house collector.....then this could be ideal? Underneath it is clearly marked Germany and the pink paint is actually quite pretty. I am intending to stay open right up until the last week of Xmas and will close on Tuesday 20th December. On January 2nd I will open for business again. So, if you a UK based customer, please continue to place your orders and I will endeavour to process them asap right up until that date. 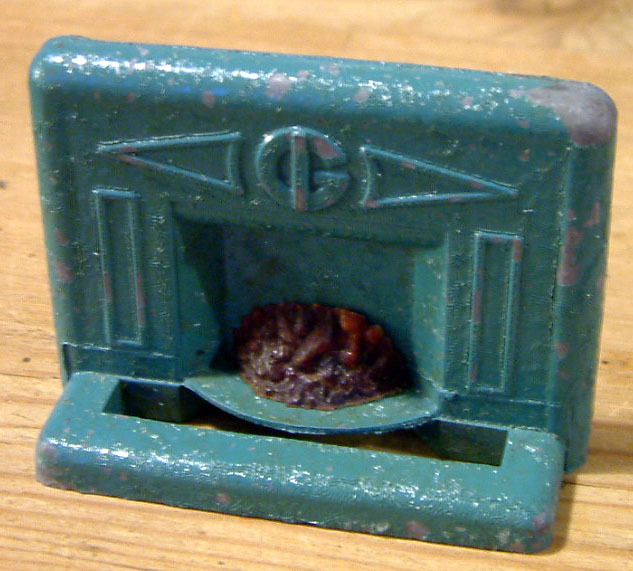 Due to a deadline on a particular project now looming rapidly I will probably be up to my eyes in glue, paint or whatever if you ring, so PLEASE do leave a message on my answerphone and I will get back to you as soon as I can. 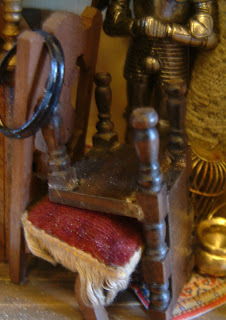 Am Now Back.....& Beginning To List Some More Vintage Goodies! Having had a few fabulous days off....am now getting back into the swing of things and beginning to load up various lovely treasures to KT Miniatures website. 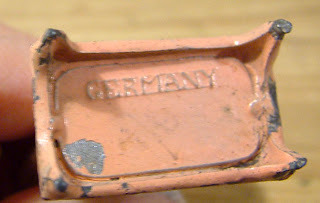 To titilate your vintage dolls house tastebuds....I have highlighted one or two things that have been listed this evening. These little Grecon beauties were snapped up within 10 minutes of their listing going live this evening.....sorry folks if you are disappointed but although I do not have anymore Grecons, I do have rather a lot of other vintage goodies for sale. 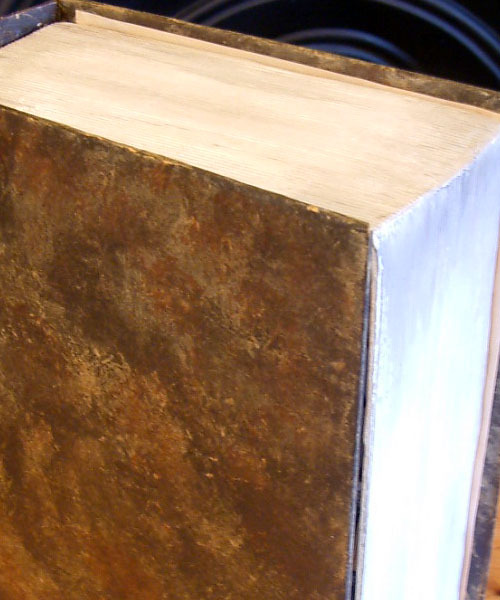 There is this vintage metal art deco style Jacqueline living/dining room suite. Although it looks very 1920s-30s in style, it was actually made post war but nevertheless would be perfect for anyone with a vintage 1920s/30s 1/16th scale house. I particulary love the fireplace and clock...arn't they just fabulous?! 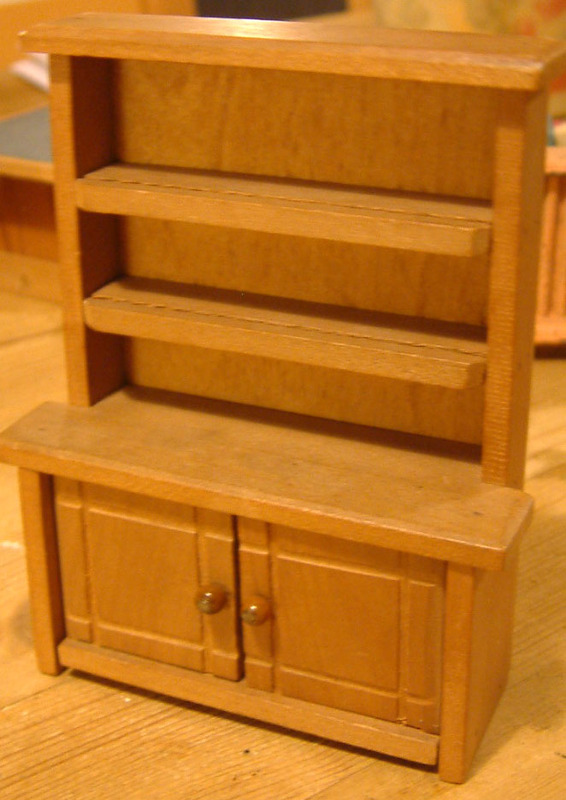 This 1/16th scale dresser intrigues me greatly....it came with a batch of 1930s-1950s dolls house furniture. I cannot decide whether it was made pre-war or post-war. 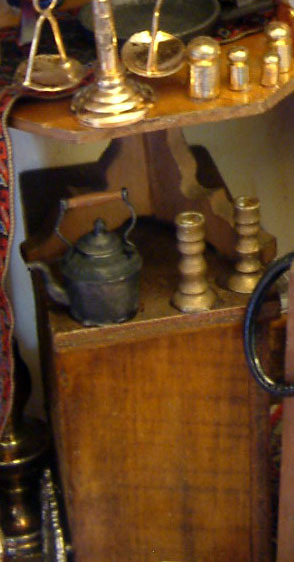 I do not recognise the maker but it appears to be very well made and has some nice touches such as the groove on each upper shelf so that crockery can be displayed easily without slipping. The door handles are tiny brown beads....not dissimilar to those I have seen on some 1930s furniture. Over the next couple of days I will be listing a variety of vintage treasures both in 1/12th and 1/16th scales on KT Miniatures...so do keep a watch and don't forget that you can email or ring to check for availability/reserve whilst payment is being sorted.